Stair Climber Trolley Dolly is the ideal Multi-Purpose hand truck to help you carry your groceries and other items up a flight of stair, curbs, sidewalks and other terrains. The Stair climber cart is collapsible for compact storage or it can become your easy to use portable Dolly while on the go. Whether you are running errands, shopping, moving boxes of supplies this dolly can help you carry it all! Stress-free without worrying how you will transport all your belongings or other goods. 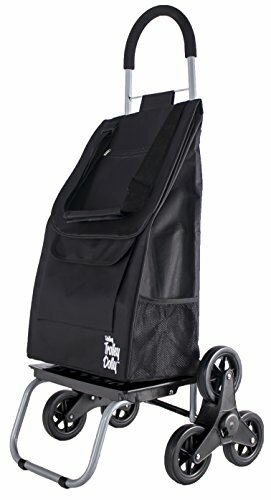 Our Trolley Dolly bag is able to carry all your items in ONE LARGE BAG IN ONE TRIP!! Let our new fully functional 6-wheel design do all the heavy lifting for you. It can lift all your belongings upstairs, downstairs, curbs or uneven paths. Take it to the supermarket, flea market or the beach; Capable of climbing high curbs and sidewalks with ease. The weatherproof material of the trolley bags keep contents dry from the rain, snow and the other forces of nature; Also includes soft ergonomic cushion handle which reduces the stress on the hands; Ideal for mobile seniors or shoppers without vehicles. Our folding Stair Climber Trolley Dolly cart perfectly balances lightweight capability with durability and features 6-wheel design that glides up and down stairs with ease. Take it to the supermarket, flea market or the beach. Multi-functional Uses; Use it as a shopping cart, grocery cart, utility cart, foldable cart, and overall exceptional cart on wheels with little to no assembly required; Remove the bag and it becomes a lightweight dolly capable of carrying up to 110 lbs. Live in a Apartment or Condo,no problem The Stair Climber Trolley Dolly climbs stairs more smoothly than any other stair climber cart or trolley on the market. Contains 7 compartments for storage, which include a beverage holder, front flap pocket, inner pouch, rear pocket and more; Your stuff goes where you go. If you have any questions about this product by dbest products, contact us by completing and submitting the form below. If you are looking for a specif part number, please include it with your message.